One of the great things about tile surfaces is that they are so easy to clean – at least at first. But while it is often easy to wipe up spills off of your tile, the grout is the area where you start to notice the passage of time and the accumulation of dirt and grime. Because the grout is a porous material, it can be contaminated with all sorts of undesirable things, including dirt, bacteria, and mold. The only real way to pull out such contaminants is through professional tile and grout cleaning. At Chad’s Carpet Care, we offer you an effective way to get your tile and grout looking clean and beautiful again. 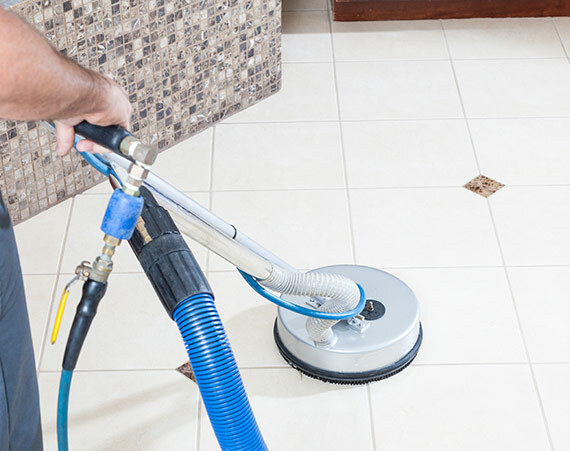 Our professional cleaning services can help you protect your tile, minimize wear and eliminate the potential health risks that come from contaminated grout. Replacing a tile floor can be expensive, and is not something most home owners want to do if they can help it. Our cleaning services help you avoid the need for replacement by protecting both your tile and the grout that keeps it all together. Professional tile cleaning is an excellent way to improve the longevity of your investment. Dirty floors wear more quickly. The dirt and other contaminants that cover your tile and fill your grout are sometimes capable of breaking down the materials that make up your flooring, especially when you add the friction that comes in high traffic areas. A thoroughly cleaning can minimize this wear, ensuring that the tile and grout lasts as long as possible. Because grout is porous, it is capable of absorbing a number of undesirable contaminants, some of which could pose health risks. Mold spores and bacteria are not things you want hanging out in your flooring, much less your counters or your bathroom. Our cleaning services can clean the contaminants out of the grout and seal the grout against future contamination. Our first task is to clean your tile and your grout thoroughly. We use the latest tools and technology to clean your tile, and more importantly grout, until both are looking their best. Our next task is to seal your grout against future contamination. We apply grout stain sealant that will prevent staining and the absorption of other undesirable substances. Your tile floors and surfaces can provide you with years, and often decades, of beauty and functionality. But like all good investments, they need to be taken care of if you want them to last. At Chad’s Carpet Care, we can help you make sure your tile surfaces are properly cared for. The focus of our company is always on customer satisfaction. We want to deliver you the best cleaning services we can without any unnecessary up-selling. Just let us know what you need cleaned, and we will do our best to make it look new again. If you have tile surfaces that need to be cleaned we would love the opportunity to talk to you. Please fill out our contact form or just give us a call. We look forward to helping you with all of your tile cleaning needs.